OLU VILLA ligger i en frodig og Serene Garden. En romslig villa med et gjerde rundt eiendommen, og en vakker tre gate. Bare noen få minutter fra stranden og ligger i et rolig nabolag. Soverom balkonger har utsikt mot bakgården ble du vil finne en polert sement uteplass med spiseplass, innebygd grill, arbeidsplass, et stort spisebord og sittegruppe! Et avslappende sted å spise frokost og middager eller å underholde venner. Fronten hagen er grønn, frodig og full av blomster og en lilje tjern. Utenfor: Tropisk hage med kokospalmer, blomster, gress og en lilje tjern. Front Hagen har en terrasse med tak og en sittegruppe. Bakgården terrassen har en innebygd BBQ med spisestue og sittegruppe. Rengjøring / håndklær / sengetøy / stuepike: Håndklær og sengetøy er inkludert. Maid service 3 ganger i uken. Tradisjonelle karri måltider kan gis. Hver morgen Sarath kommer til å møte og vann hagen. Annet: På forsiden av huset er det en terrasse med tak, vifter, og en sittegruppe med utsikt over hagen. We spent a week of our month-long trip to Sri Lanka at Olu Villa. Nina was extremely efficient and helpful in the reservation process and went the extra mile to FaceTime me to help ease the payment process. She also provided us with lots of useful information prior to our stay and organised some shopping in advance of our arrival. We were warmly received by Sarath and Nina's husband Niluk who explained how everything worked and we made arrangements for Kumari, Sarath's daughter, to come th following evening to cook for us. The curries were inexpensive and delicious - and plentiful enough to provide a second dinner. The downstairs living area is vast, with cooling fans but no air conditioning. A spacious bathroom is also situated downstairs. There are doors out front and back to beautiful, well-tended tropical gardens, both with tables, seating areas and overhead fans. The kitchen is well equipped. The two double bedrooms upstairs are generous and have air conditioning and mosquito nets. Both have balconies overlooking the back garden. The larger bedroom also has a settee. Both have plenty of wardrobe space. It was a pleasure to lie in bed in the mornings with the shutters open and watch and listen to the birds and monkeys in and around the garden. Being there in March, the weather was at its hottest and most humid and we were very grateful on some evenings to be able to sit upstairs in the cool of the air conditioning. We were advised to close the shutters at dusk to avoid bugs but told that it would be ok to open them again once it was dark. We may have been over-cautious but we tend to get bitten so we didn't want to risk it. It was quite easy to get a tuktuk from the road outside the villa to go to local beaches or into Galle and we also made use of Sarath's other son and his tuktuk/ contacts. We enjoyed the beaches, particularly Wadija but we also enjoyed visiting The Jetwing Lighthouse Hotel which has two beautiful pools overlooking the Ocean and who sell day tickets for 1500 LKR. On one of the cooler days we also enjoyed walking round the walls of Galle Fort and exploring the shops and restaurants. I also enjoyed a massage the nearby centre in the Ayuverdic Village, only a few minutes walk from the Villa. We saw Sarath most days and he was extremely attentive and helpful. We travel a lot and it's always good to find good self catering places - definitely recommended. Thank you for your great review. It was a pleasure to have you both as gusts and i hope the last days in Colombo was good too! Eine schöne Rückzugsoase nach dem extrem stressigen und hektischen Srichtig Lanka. Haus und Grundstück mit Terrassen waren sauber und ordentlich. Die Besitzer waren nett und hilfsbereit. There is little more to say about this property that hasn't already been covered by other reviews. It has everything you need to make your stay in SriLanka an unforgetable experience. Sarath was on hand to make sure we had everything we needed and the home cooked currys by his wife and daughter were some of the best we have ever tasted. The driver, Niron, was very helpful taking us to the turtle hatchery, herbal gardens and the tea plantation. A visit to the local Buddhist rock temple is a must. We spent a wonderful 4 days at Olu Villa last week, which was the perfect end to our 3 week holiday IN Sri Lanka. Our hosts were warm, friendly, helpful and attentive. Sarath was there to greet us, provide a house tour and was available when we had questions. The house is a 10 minute tuk tuk ride from both the beach and Galle Fort, where there are a number of great restaurants, cafes and shops. The home has everything you could need, is set in a beautiful yard with wildlife around and is this piece of quiet paradise that we loved. Wish we could have stayed longer! A great place for a relaxing sojourn! 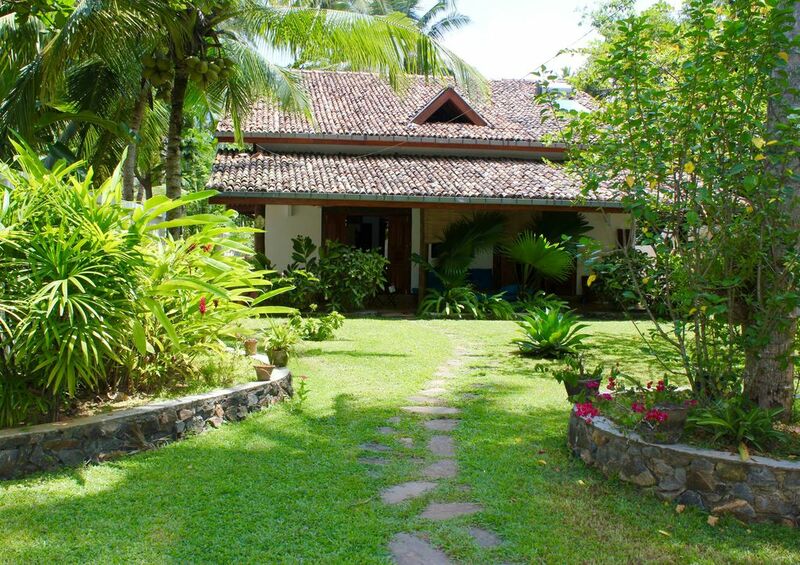 A gorgeous house with huge living spaces and large bedrooms with a view over the back garden to watch the monkeys frolic in the early morning. The decor, nets and air-con make it very comfortable. We spent a lot of time on the front veranda, lounging on the settees covered in superb local cotton fabrics, with the fans gently spinning overhead. The kitchen has every conceivable piece of equipment to cook up a storm, however we were more than happy to limit ourselves to breakfast of coffee and fresh fruits and snacks. The Sri Lankan coffee our hosts had got in for us was great (although we would have preferred to brew it in a press rather than the drip machine or espresso maker) as was the variety of fruit and the fantastic local curd! Certainly recommended. Another must is to have a delicious meal cooked in house for you by Nina's mother in law and sister in law - a mouth watering array of curries and sambals with distinctive Sri Lankan flavours. We spread it out over 3 days so order yours early in your stay! Although we didn't do a lot of sight seeing, Niron was always ready to take us places in his tuk tuk and no request was too much for him. He had plenty of suggestions for other sites to visit and got us safely to the airport and on time despite a major festival taking place. Thank you for your great review:) i am glad you enjoyed the stay! Très belle villa à ne pas manquer!! I området finner du cookingclasses, massasje, yoga, skilpadde klekkeri, templer, stylte fiskere, rismarker, mangrove skog, Galle Town og Fortress og krydder hagen. En 3-5 minutter tuk tuk-stasjon eller en kort spasertur til nærmeste strand. Unawatuna stranden har også en rekke butikker (i backstreet) restauranter, barer og utesteder. Vi kan tilby plukke opp på flyplassen. Å enkleste måten å komme til huset fra flyplassen, med innleid van med sjåfør, tar den nye motorveien. Det er en liten toll avgift for å bruke motorveien. Det er også busser og tog med avreise fra Colombo, som ligger ca 40 km fra flyplassen. For å unngå trafikken, prøv å planlegge du ankomster tidlig på morgenen eller sent på kvelden. Galle byen er ca 2 km fra huset. Her finner du det meste du måtte trenge, verktøy butikker, supermarkeder, frukt og vegetabilsk markedet, fersk fisk og sjømat, vin butikker og klesbutikker. Galle Fort er også et fantastisk sted å besøke med små gater, antikke og gullsmedbutikker, te / kaffe steder, interiør butikker, og en spektakulær turer på veggen fort. Theres er et supermarked, postkontor og apotek i ca ca 5 min gange fra huset. Det er en stor antikviteter lagre ca 15 min gange unna som er flott å besøke hvis du er en skattejeger. Theres er ingen minibanker på strandområdene i Galle distriktet. Minibanken er å finne i Galle City 2 km unna. Svært få steder på stranden tar kredittkort av noe slag. http: // www. youtube. com / watch?funksjonen = player_embedded & v = GFmPnX6jHzI #! Changeover Day: Arrival and departures times will be agreed on upon booking of the property. But normal times are check out 12.00 Check in: 17.00 Notes on prices: Price can be negotiated for stays longer than 3 weeks in the high season. In the low season stays longer than a month will get an substantial discount.